He wasn't that impressive to begin with but he has improving each race. I think he and Ocon can be real prospects, especially Ocon. Verstappen let the hype get to his head. It's a perfect way to sow the seed of entitlement behaviour. Don't get me wrong he is a great talent, although overrated. We haven't seen that much of him yet. People were calling him the next Senna etc before he even had his first season. To hear that as a 17 yo would probably get to anyones head. His personality is boring and he is often a gigantic whiner. If they want to give him a reward for anything it should be that he is exciting on track! But I don't think he is deserving that either after all the ugly defensive moves he has done. You've misunderstood the quote; the repetition of 'F1' that you added in your sentence is important, and changes the meaning. "however he got to F1 is not material"
However he (Stroll) got to F1 is not material (doesn't matter). The quote means that the path Stroll took to F1 doesn't have any bearing anymore, because he's in F1. By adding another 'F1' before 'material' you've made the quote say that he's not F1 material, but that's almost the opposite of what it really says. Stroll is testing in Suzuka this week, 2 or 3 days. Another good finish by stroll. Gave highly rated ocon all he could handle. Still having trouble in Qualifying, but finding his pace in the races. He's not bad. He's no Max but he has decent pace. He needs to figure out how to put together a qualifying session but he seems to have some potential after all. He's not just some rich kid pay driver. Not bad for a kid who just turned 19, driving a not so great car, fighting with the highly touted ocon. He didn't come into F1 when the cars were easier to drive like max. I'm not saying he is another max but he couldn't have come into F1 at a worse time with the big change in rules. His true test is going to be next year. The main reason he closed in on Ocon is as he was on Supersoft tyres. And to add the high altitude & thin air didn't affect the tyre wear. When Stroll got within 1 second of Ocon tow or three laps before the finish, Ocon raised his game & created a 3 second gap or so. No doubt, both are the future stars of F1. I certainly think Stroll did really well in the race, but Massa looked stronger all weekend. I am pretty certain Massa would have been 5th this race if it wasn't for his puncture. But he still recovered to 11th when he'd fallen right towards the back with the other drivers that suffered, although not quite as far back. But he boxed then and not again. The others such as Stroll gained a small advantage by pitting during the VSC. So Massa really lost out here but still made a decent recovery. But I have to admit, Stroll really is looking good. But Massa has still got enough pace in him to deserve to be in F1 IMO. He was better on the whole this weekend. I just don't know how many people will think that as he finished out of the points. Stroll has improved greatly since the opening of the season. The same can't be said about all the other drivers. Who consistently 'hooked it up' in their 1st year in F1 with 2nd line equipment? Indeed, I have no problem with Stroll being in F1 at this time, he's shown himself not to be an idiot, but the car is good enough to consistently score points and on occasion he has done this so he certainly is not out of his depth. However speed wise you have to venture he may be the slowest driver on the grid but then again he is a rookie, but it's something he needs to improve. He may have earned the title of most improved considering how he started his f1 career. I'm looking forward to see what he can do with a year of experience under his belt. I had a thought yesterday. Stroll's debut season reminds me a lot of Jenson Button's. Put in the seat before he was really ready, inconsistent result's in a car that should almost always be scoring points etc. Any criticisms thrown his way today would be very justified. He was unfathomably slow in the Brazilian GP and all race weekend. It was a horror show. He is near the end of his first season yet produced a debutants performance amd at the worst possible time. Abu Dhabi has to yield much better for him. He is looking like someone who needs a year of testing and GP2. There has been moments of promise and I have been sympathetic towards him. But this should concern Williams gravely. Stroll is such a strange driver. He showed he is decent in the wet, which is a big plus. He has decent race pace sometimes, but he has absolutely no one lap pace. He was also supposed to be crash happy but he's been anything but. I can't figure him out. I think he starts trying too hard and gets scruffy when the car isn't optimal. His last lap or two were awful in qualifying. What concerned me in Brazil was his description of his tyre failure. He came over the radio saying something was stuck/hanging off his tyre like it was debris. From what I saw it looked like a chord within the tyre which became exposed due to the tyre delaminating. Happy to be corrected if I'm wrong. The issue for me is that he doesn't have a very good mechanical understanding on his car. Like when in Monaco he came on the radio basically asking for help on how to keep his tyres warm (or something similar). To be blunt, he ain't going to win championships and lead teams unless he improves his knowledge. His race pace seems ok as well as his wet weather skills. Improving his knowledge on car setup will help him get more out of his tyres and will improve his qualifying pace. Well, daddy did shell out for two private tests I believe? A good driver describes his observations to the team, he does not attempt to diagnose and solve the problem himself. He reported what he observed. I will be the first to say he had a very bad day at the office at Interlagos. Even though he is a fellow countryman (see my sig below) I wish he succeeds but I do not ignore his shortcomings and faults, nor do I defend him. And yes, his mechanical knowledge appears to be lacking. But here we have a rich boy who had everything paid for him, and up until he got to Formula One, there were engineers and staff oh his team who did the boffin stuff. But we are talking about a driver who finished 6th in the previous race. I agree, we've seen enough flashes of talent to know that there's a good Formula 1 driver in there somewhere, but his inexperience has been so apparent this year. If it weren't for Max Verstappen, Williams would have been lambasted for putting a driver of Stroll's age in a race seat. Sadly Lance is not the prodigious talent that Max is. I would agree about describing this issue to the team rather than diagnosing, but in this case I thought it was simple enough for him that he should know the issue. I agree about him not been told this stuff as a junior driver, which is disappointing because it is limiting his growth. As you point out, you don't finish 6th without some natural talent, but perhaps more time as a junior would have helped him be a more well rounded driver when entering F1. I believe this is an issue in the modern generation across the world, kids being placed into situations they aren't ready for. Yes it worked for Max, but how about Jaime alguersuari and countless kids we will never hear off. Jaime was 19 and clearly out of his depth. Eventually after a season or two he showed his potential but it was a bit too late. There are examples here in Australian Supercars as well, where you look at it and go, maybe the kid needs more time in lower ranks to become a good driver. But, money and in some cases the ego of parents living their dreams through their children (Jos is the poster boy for this) pushes kids into these awkward positions. I may have gone slightly off topic here, mainly because I don't believe Lance is entirely at fault here, more so the development system. The Stroll's methodology was just to get the necessary license points and then head straight for F1. His radio outburst in Monaco was quite telling. He may well hang around for a few years - with money, most lower teams would have him, and he's not an awful driver, just extremely inconsistent. I really want him to prove me wrong, I just can't see it coming.. But how much of the tire can he actually see while hunkered down in the cockpit to be able to tell that it's chords from the tire and not something stuck to it? I'm sure that he still has a lot to learn about communicating things that are going on with the car but I don't think this particular incident is something to put up as an example of that. It is interesting that some hold to the belief that any driver should be able to properly diagnose some problems with the car, despite the simple fact that the teams are designed around having the engineers in the garage perform that function. Have you ever seen any video or pictures of many people monitoring the car's telemetry during a race? What if a rookie attempts a diagnosis and gets it wrong? If I was a team owner I would direct any driver, rookie to veteran "you just drive and report your observations. We have very many intelligent and skilled engineers in the pits, the car has almost 300 sensors giving us data, and this car is incredibly complex." To arrive at a proper assessment one needs all information. This is further information, I won't tell you what conclusion you are supposed to arrive at, think for yourselves. In FP3 his gearbox failed, also damaging the engine. Both had to be replaced. The team installed a used and old unit, and it was down on power. In an effort to keep up with Grosjean, he had to perform a maximum dive bomb at the end of every long straight. We witnessed a few lockups, which resulted in the tire going south. So do we chastise or applaud a rookie driver for over-driving his car? Hamilton got a torrent of criticism for going off in China and a shed load of praise for his balls out attitude that kept him with Alonso all season. I'm just wondering what team allows a driver to compete on tyres in that condition, Hamilton asked to pit several times. 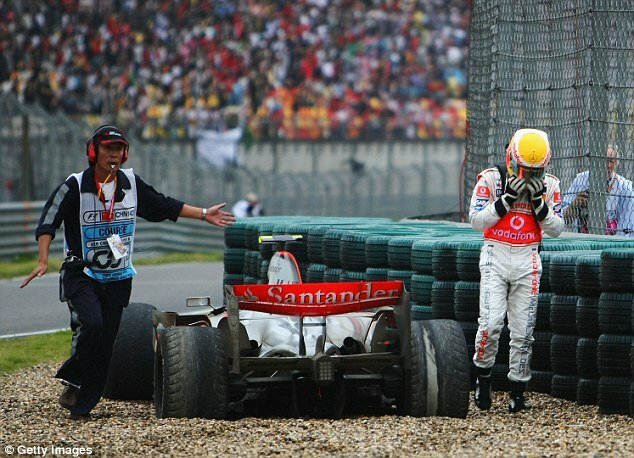 "When I was out of the car I was just gutted because it was my first mistake all year and to do it on the way into the pits was not something I usually do,” was Hamilton’s take in the immediate aftermath. "You cannot go through life without making mistakes. But I am over it and we look forward to Brazil. We still have points in the bag." I think Stroll has just been up and down this season. Came into F1 too early, but from some of the good performances he's done, I think he's good enough to deserve to continue even without the Money. But over Massa? I don't really know. Massa clearly was better overall and had a very solid year. Very likely will have scored points in every single race accept China and Maybe Hungary if he hadn't had his bad luck. Stroll may have sounded immature on the radio, but if I'm honest, I though Verstappen's team radio was just as bad in 2015. And he made mistakes that a rookie may do. Not to do with crashing this but there was one practice session where Verstappen was told to park his car, but he did so in the most inconvenient place. He's since got much better. All rookies make mistakes at times but hopefully learn from them. I thought Stroll's message this race about something being stuck to his car was a bit strange, but we should respect, that from the car when you ahev a flat spot and the car is shuddering like hell that you could well be wrong with what you think it is on your tyre. I think any driver may have made that mistake and assumes it was debris from the drivers seat view. Yes, it was triggered from a lockup, so perhaps he should have known, but it surely isn't unusual for a rookie to assume things like this. Although it makes him seem inexperienced, asking for as much help as possible so long as it is in the rules may be the best way to learn and get better for him. One thing I think we should all respect is his drive in Baku. Even though Massa looked better, that was a really solid drive by Stroll. Many people said he didn't deserve the podium, but I disagree. He may not have been outstanding, but loads of the drivers behind him or ones who retired were ones who made mistakes. So he was more solid than most that day. And it is very likely he will be the only driver this year outside the top 3 teams to get a podium. I wouldn't even rate Williams as the 4th best team on the whole. So the fact that a driver that gets criticised for being poor, getting a podium that day was mighty impressive. I think he will improve over time and his money towards Williams will hopefully be a huge bonus. For the posters criticising stroll watch some of the in car camera shots on you tube. There are not very many where it doesn't looks like the car is ready to jump out from under him or in the last race where the car had a lot of understeer on his Q1 attempt. Whether it is because of his inexperience or the inexperience of his engineer there are not many in car shots where the car looks like it's predictable. Even massa's in car shows this is not that great of a car. Watch massa's in car during the race, he had to use all his experience to hold off alonso. The only thing that saved him was the engine. I like williams and of course being canadian i'm going support stroll but, come on paddy, design a car thats worthy of the williams name. His recent version of events is somewhat different. I daresay his recollection of events at the time it happened was much sharper than it is now. I think you guys have missed my point. Rookies make mistakes and have bad days at the track. Yes, immediately after that bad day the driver deserves to be held accountable. But in the big picture of an entire season, not only the bad but the good must be weighed. Or he just towed the team line at that time, now he asks why did the team leave him out on tyres worn down to the canvass. That's fair enough but you was also making a point about mechanical awareness, Hamilton was well aware about the poor condition of his tyres, McLaren decided to leave him out.